In the Dallas/Fort Worth region, there are New Year's Eve options for everyone, from the raging party animal to those seeking a more relaxed evening. On the last night of the year, the area offerings range include elegant sit-down dinners, live music with full orchestras, on-your-feet-dancing parties and even dance venues for non-drinkers to help welcome 2019 in style. Pay tribute to your Lone Star roots on New Year's Eve at Billy Bob's Texas, located in the historic Fort Worth Stockyards. The venue bills itself as the world's largest honky-tonk and on the bill for New Year's Eve is a local favorite, Randy Rogers Band. The doors open at 6 p.m., and the band will start laying down tunes at 10:30. Reserved seats are available, while general admission tickets cost $20.00. Get down with greats sounds for New Year's Eve at House of Blues. Party like it's 1999 as Prince's backup band, The Revolution, is the featured performer, along with a packed line-up of other groups. The New Year's Eve celebration in the exclusive Foundation Room will feature a seven-course prix-fixe dinner with two seatings, 7:00 p.m. and 9:30 p.m., with live music and a champagne toast at midnight. Several V.I.P. packages are available. 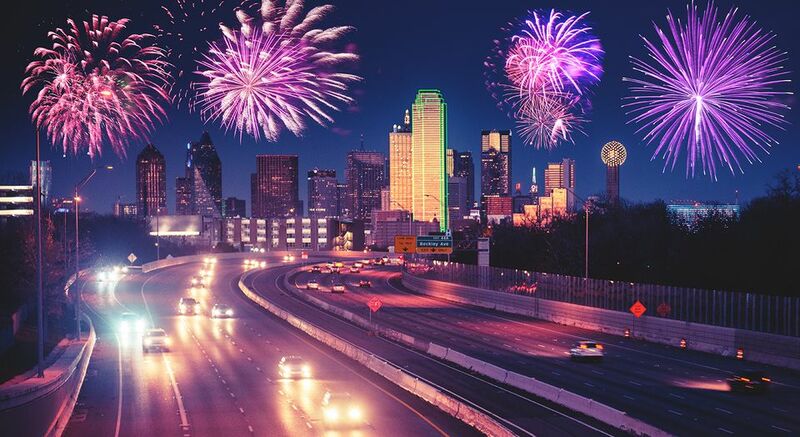 Leave the driving to them on New Year's Eve with this annual Dallas event. The crawl runs from 8 p.m. to 2 a.m. and guests can jump off and on the transportation as it loops around to various bars and clubs that are part of the event. Party favors​ drink specials, and a midnight champagne toast are included. The fun starts at The Nodding Donkey or Bar & Grill, and revelers can toast to their own magnanimity knowing that a portion of the proceeds benefit charity. Take a step back in time at The Kessler with its Dancing & Desserts with The Singapore Slingers celebration. The Singapore Slingers are a leading source for pre-swing American dance music, like rags, fox trots, waltzes, and hot jazz. Under the direction of impresario Matt Tolentino since late 2007, the band boasts a complete orchestra of musicians that evoke the big band era. The vibe aims to recreate a 1920s society club, so put on your dancing shoes and dress for the occasion. The bar opens at 7 p.m., and the show starts at 9 p.m.
Tickets range from $35.00 to $300.00 and include dessert, plus a complimentary champagne toast. If you're seeking glam, glitz, and fireworks for New Year's Eve, then the place to go is the West End Event Center in downtown Dallas. The party is on from 9 p.m. to 2 a.m., and the hosts are celebrating the fourth anniversary of the party with a casino night theme. Tickets include a champagne toast at midnight, private party rooms, dinner packages, open bar, and $10,000 in chips to gamble away. Plan to dress formally for this glamorous New Year's Eve party to compliment the intricate masks provided. Ticket prices are $100.00 and pricier V.IP. packages are available. Move your body and soul at a New Year's Eve Conscious Gathering. The alcohol and drug-free venue will lay down beats via DJ Cosmic Soup, DJ katiedid so guests can dance from 7:00 p.m until 2 a.m. In addition to a kombucha toast at midnight, there is a henna station, raffle, and live art displays. To facilitate finding your zen during the night, the hosts recommend bringing a meditation cushion, yoga mat, water bottle, blanket, and pillow.